Bokashi is a Japanese word literally translated as shading off. It has come to denote the process of anaerobic fermentation of organic waste that produces what is known as beneficial and effective microorganisms. The resulting organic material might be likened to probiotics for the soil. The production of effective microorganisms (EM™) by the bokashi method results in an organic composting material full of goodbacteria that work synergistically to crowd out bad bacteria and bugs. When placed around a plant or in the soil, these microorganisms improve soil quality, protect plants from insect infestation, and increase the nutrients available to plants. In addition to the usual kitchen scraps that end up in a compost bucket, bokashi allows for the inclusion of bread, fish, prepared foods, pizza, pasta, pastries, cheese and other dairy products (no milk or liquids), pits, meat (cooked and uncooked) ... and bones. Yes, bones! Because this method takes place in an air-tight container at room temperature, the resulting fermentation is usually quite rapid. Two weeks is the average length of time, although pits and bones will take longer. Without oxygen, the materials ferment rather than putrefy, and the smell of well-fermented bokashi is much like the smell of cider vinegar. In fact, strong putrid odors and the presence of dark gray, black or green mold indicates that the process was not successful, most likely because the bucket did not remain air-tight. 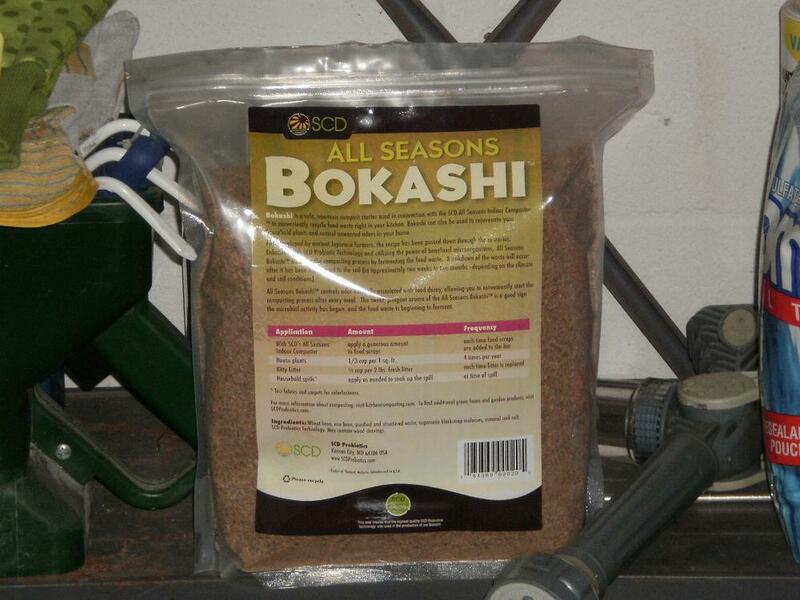 But even unsuccessful bokashi can be buried in the ground away from plants and gardens, sprinkled with microbe mix, and will continue to break down and recondition the soil. At the end of the bucket fermentation process, properly fermented bokashi will look much like it did at the beginning but will have an appearance often described as similar to that of food that has been pickled. Kits for making bokashi are available commercially for under $50. These are generally comprised of an air-tight bucket with a spigot to drain off the liquid (called juice or tea), a press of some type to pack down the contents of the bucket while expelling air, and a bag of dry microbe mix. The latter usually consists of bran that has been inoculated with a special mixture of microbes used to start the fermentation process. For the do-it-yourselfer, homemade bokashi buckets can be fabricated fairly inexpensively from materials that are readily available at most hardware stores. Making a homemade fermentation-starter is also an option. Following the initial purchase of a commercial kit, the only thing that will need to be replaced occasionally is the microbe mix. Simply explained, organic waste and microbe mix are layered in the air-tight bucket. 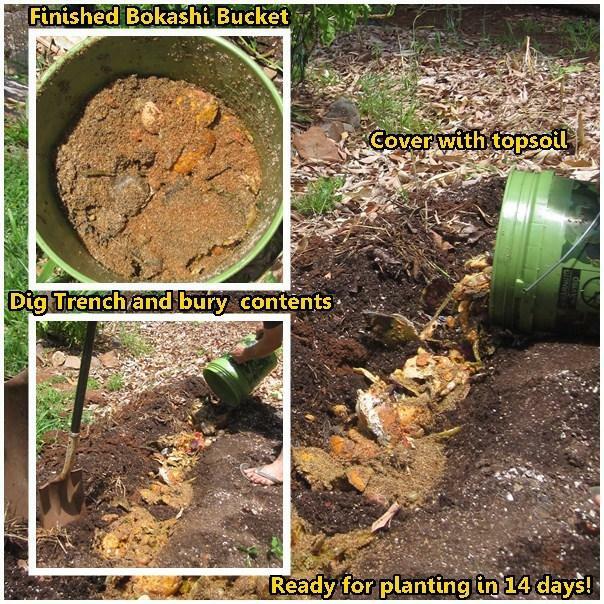 After approximately two weeks, the fermented bokashi is removed and buried in the ground where it will continue to decompose rapidly while releasing beneficial microbes into the soil. Because it is still in the process of breaking down and is highly acidic when removed from the bucket, it should be kept away from plant roots for several weeks. Burying it between rows of plants or in various spots around the garden and yard or burying it about a month ahead of planting time are the best methods for introducing the bokashi into the garden. 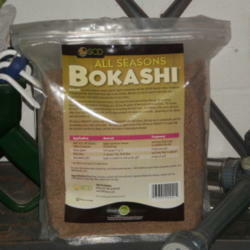 Bokashi can be mixed with regular compost and can also be added to vermicomposting bins. Worms love it. Bokashi juice is the liquid that results from the fermentation process. It is drained from the bucket about every three days as the process goes along. The juice can be diluted with water to make a very effective fertilizer. Undiluted juice can be poured down household drains where the good bacteria in it will go to work breaking down gunk, grease, and hair in the pipes. It's safe for septic tanks and the microbes can actually help to make a septic system more efficient. The bag of bran containing the microbes that will start the fermentation process is usually labeled as either bokashi or EM™*. Since this is in a dried form and will not harm plant roots, it can be put directly around plants in the ground as well as in pots, sprinkled on top of soil, and mixed with planting medium at planting time in addition to being used as the fermentation starter for the bokashi bucket. 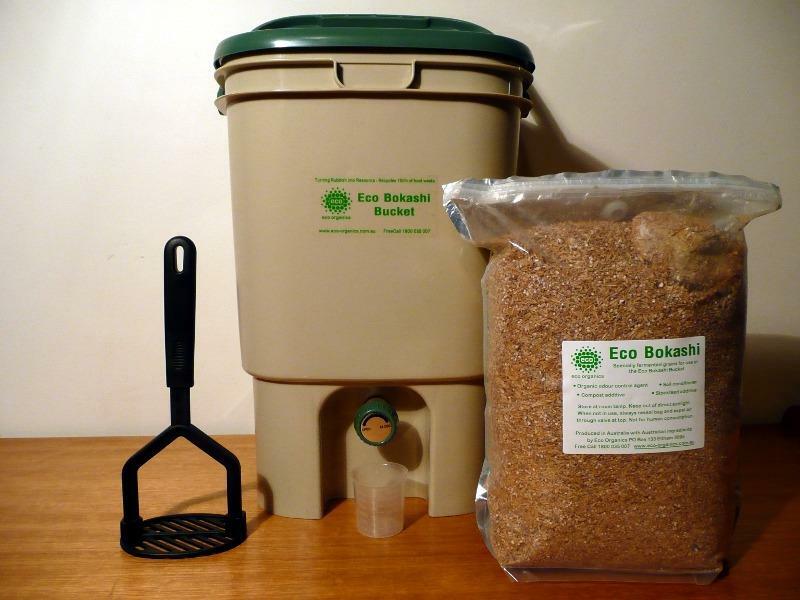 Because the bokashi process is one of fermentation rather than composting, very little heat is lost during the process. Thus, the resulting organic material retains nearly all of its energy and almost the entirety of its nutrients as well. Additionally, fermentation produces fewer greenhouse gas emissions compared to other methods of composting. 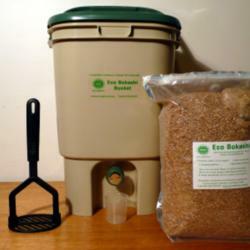 The method also reduces insect or rodent problems sometimes associated with composting. 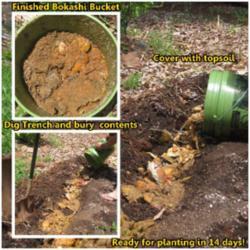 In the end, beneficial microbes are released into the soil and an extremely valuable soil conditioner and fertilizer for the garden has been produced by using the bokashi method. The capitalized word Bokashi® is also a registered trademark of SCD Probiotics company. The use of the word bokashi in this article is strictly generic and is not intended to promote or endorse a specific product. The photo to the right is courtesy of Wikimedia Commons and is GNU licensed.